Republican presidential candidate Jeb Bush has proved that there is indeed time for a little fun and games in this world, even when you’re very much in the spotlight as one of the individuals vying to become the most powerful man in the world. 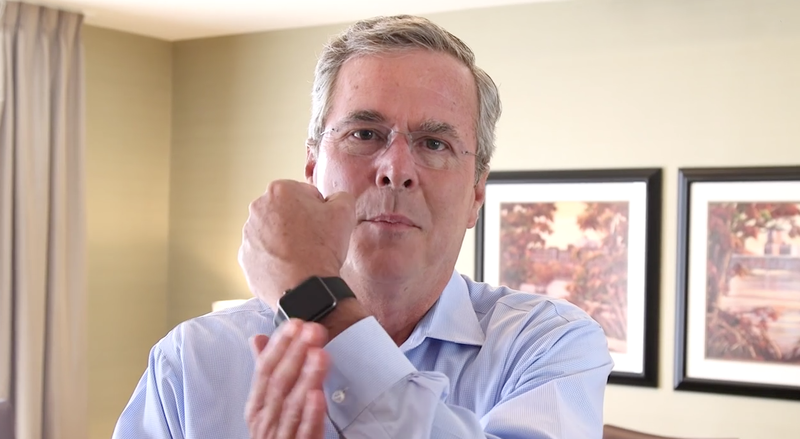 In a new whimsical 46-second campaign video entitled “Jeb’s Silicon Valley Favorites List” Bush, or “Jeb” as he generally prefers to be called, reveals his not so secret love of Apple gadgets along with his preferred Twitter hashtag and even more bizarrely, how he likes to dress. The official campaign video, paid for and endorsed by Jeb 2016, Inc, features the former Florida governor in front of a camera with visual overlays asking a series of questions about Bush’ preferences when it comes to technology. Bush instantly opts to Apple iPhone in his pocket rather than a BlackBerry device, which some may think is not the best choice security wise given his current position as a presidential candidate. Personal choice is personal choice though. The Republicans’ love of Apple continues when he chooses “MacBook Pro, baby” when asked if he would prefer a laptop or an iPad, and goes one step further when he brandishes his own personal Apple Watch when given the choice of Apple Watch or Apple Pie. Jeb also confirms that he prefers the #FF Follow Friday hashtag over the #TBT Throwback Thursday creation and that he simply cannot wait for driverless cars to be introduced in the future. Bad news however for Mark Zuckerberg and the late Steve Jobs. Jeb would simply prefer to turn up for work in a nice, crisp fitted shirt rather than a Steve Jobs turtleneck or a Mark Zuckerberg hoodie. Makes sense considering his political position. It’s unlikely that the video will garner enough support from within the tech community to make Bush a sure thing for The White House when the time comes, but it is extremely interesting to get an insight into the technology preferences of a well-known politician. Check out the 47-second, light-hearted video for yourself and see if you agree with his choices. I wonder when the media will ask him about his contribution and involvement in PNAC? Dude, you’r damn persistent with those comments. Tip: Put your energy on something you like instead. #Fagdroid. if this guy wins the presidential election its over. time to revolt. The fastest սոⅼοсking site I have ever use for AT&T devices is just google atttiphoneuunloockiing, never took us over 6 hours to ՍΝᏞΟᏟΚing some of my l0cked devices, we have the facility to սոⅼοсking the new 6S and 6C as well.